Team members want a centralized calendar containing all the items from their personal calendars copied to a single public calendar for easy viewing of a composite schedule. For each user, the Add2Exchange Administrator will set up a normal, one-way relationship between each personal (source) calendar and the public (destination) calendar. Items made in the Source can be automatically copied and tied to the Destination. 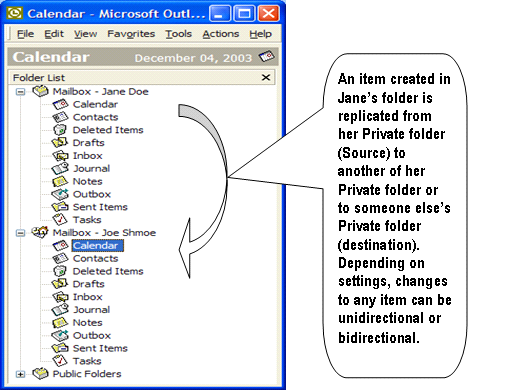 The relationship can be set to copy or not to copy items marked "Private" in Outlook. This type of relationship is useful if Management wants to place an item in the public calendar and automatically have it copied and tied to a user's personal calendar so items can be synchronized down to mobile devices. This scenario requires a normal, one-way or two-way calendar relationship between the public calendar and each user's personal calendar. 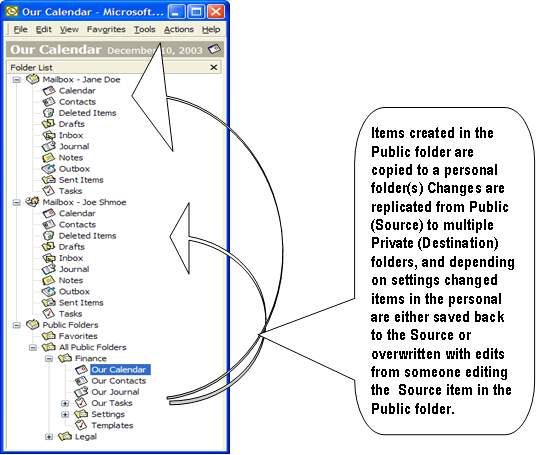 If the user's personal calendar is to be copied to this (or another public) folder, another relationship of Example 1 can be set up as well. This is what is termed "mutual synchronization". For mutual synchronization, you will need two relationships: a relationship from private-to-public and a relationship from public-to-private. In this case, since the Source and Destination folders are the same pair, the relationships are symmetric, but not tied together and act independently of one another. Please Note: For editing in either location and having the edits go back to the Source, the relationship has to be two-way, where the Destination can overwrite the Source. There are many types of private-to-public, public-to-private, or private-to-private folder combinations available – with each relationship acting independently of the others. The most common use of Add2Exchange is to synchronize group calendar, contact and task folders to a user's mailbox and vice versa, so your mobile device synchronization software (such as IntelliSync or Microsoft's ActiveSync or Windows Mobile) can bring it to your mobile device. One limitation of the current version of Add2Exchange is that all folders must be within the same Exchange Server or Cluster. Add2Exchange can synchronize between public and personal folders on different Exchange Servers only if there is a trust set up between the Exchange Servers and the public folders are synchronized across the servers. This release of Add2Exchange will not synchronize private-to-private across Exchange Servers or without a working trust. Once installed, you will use the Service Account and the Console to create relationships. The Console is available from a new shortcut on the desktop. The Console is used to build and manage synchronization relationships. The following are scenarios of how Add2Exchange can solve common relationship needs. Our example uses calendars but is very similar for Contacts and Tasks. Add2Exchange does not support synchronization to PST files. If you need to synchronize between a PST file and an Exchange server, our Add2Outlook product supports this feature. In this scenario, a user wants her mobile device to receive the meetings from the public calendar. A public-to-private relationship is built to the calendar folder in her personal mailbox, with which the mobile device then synchronizes to receive the appointments. The same Source folder can be involved in more than one relationship, so the public calendar can also be synchronized to another user's mailbox by building a separate relationship. Since this is a calendar relationship, not every appointment from the public calendar will be synchronized to the users' folders, only those which fall within the Synchronization Window. The Synchronization Window is configured to include everything within the next thirty days by default, so each user will see the next month's meetings appear on their calendar. It is possible to extend the Synchronization Window further into the future or into the past as well. Items which have been synchronized to a user's folder and no longer fall within the Synchronization Window are not deleted from the Destination but will not receive updates from synchronization. In this scenario, an executive wants to share her personal calendar with her administrative assistant. A private-to-private relationship is created from her calendar to the assistant's personal calendar. Private-to-Private relationships require a Pivot Folder, a public folder that exists solely for the purpose of synchronizing Add2Exchange relationships. 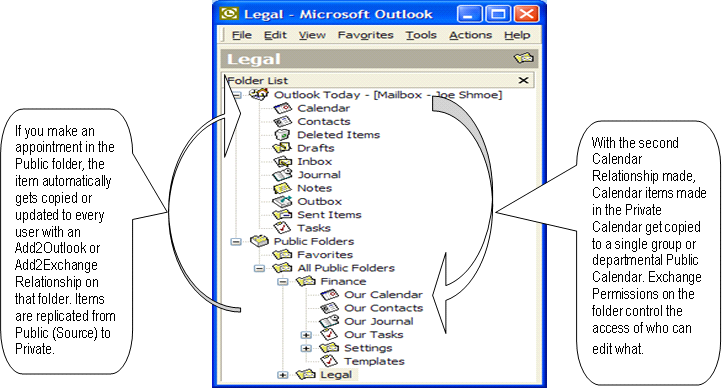 For more information on Pivot Folders, see the section Create Pivot Folders. If the administrative assistant needs to make changes to her appointments, a two-way relationship would allow him to edit the meetings and have those edits synchronize back to her personal calendar. A one-way relationship does not permit changes to affect the Source folder. See the section Relationship Setting Reference for details on these settings. Note that since the relationship is from the executive to the assistant, the items entered in the assistant's calendar are not synchronized to the executive's calendar. This means even if the original relationship is set to be two-way, there is no way for the assistant to add new appointments to the executive's calendar. The directionality of a relationship only affects whether changes made to items originally created in the Source travel in both directions. For Add2Exchange to add new items to a folder, the folder must be a Destination of a relationship. Therefore you would have to set up a separate relationship from the assistant's calendar to the executive's in order for Add2Exchange to let the assistant's calendar create new items in the executive's. This also means the executive would see all appointments from the assistant's calendar except for those marked "Private" in Outlook (as long as the relationship is set to not copy items marked "Private"). For more information, see the section Relationship Setting Reference. Such a configuration where there are two relationships between the same two folders is called a mutual relationship (singular), although it is actually two distinct relationships. Each relationship is the mutual relationship of the other since the Source and Destination folders are swapped. The two relationships typically have the same settings, but are independent and can be configured separately, or even be created at different times. It is just the fact that they exist between the same folders which makes them mutual relationships, not when or how they were created. Recall the scenario of synchronized items from the public calendar to the executive's personal calendar. 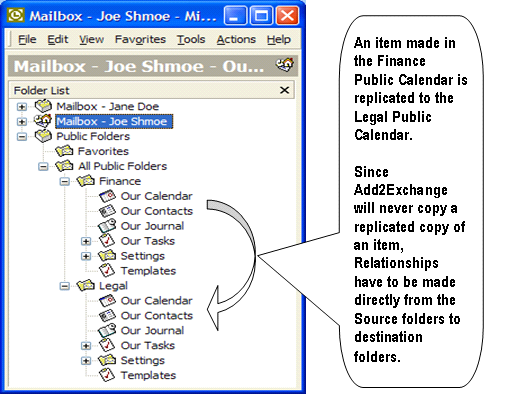 Note that any of these items created in her folder by Add2Exchange will not be synchronized to the assistant's calendar. This is because Add2Exchange does not recognize items it has created as source items for other relationships, as it could lead to a synchronization loop which would fill up an Information Store. If you wanted the public calendar items from that scenario to show up on the administrative assistant's calendar as well, you would set up a separate public-to-private relationship for him just as we did for her. Add2Exchange can also synchronize directly between public folders. This can be useful to consolidate calendars or contacts from departments within a Business Unit, for example. In this scenario, a mobile device user wants to be able to both see items from the public calendar as well as add items to the public calendar by entering them on their mobile device. This requires a mutual relationship as described in the Private-to-Private Relationship scenario. While this will allow items to be created in the public calendar from the user's mobile device, Add2Exchange will not synchronize these items to other folders as described in the Private-to-Private Relationship scenario. In order to do this, you must create private-to-private relationships from the user to every other user who needs to see that information.